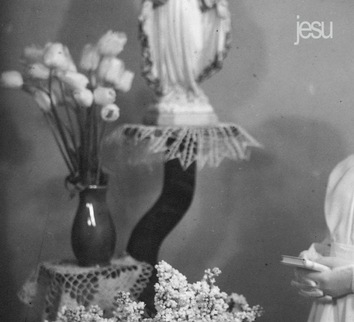 Beginning with ‘Homesick’, with its guitar hooks, shoegaze textures and familar jesu sound, one can be mislead into considering that this new album will follow a familar jesu trajectory, but instead the following tracks use jesu’s aeshetic and take in dub, post punk and electronica along the way, to create maybe the most dynamic jesu album to date. The epic ‘The Great Leveller’, at over 17 minutes, is the boldest statement of the songs here — featuring the album’s only other player besides Justin, Nicola Manzan, who commands a one man orchestra of strings, a new and welcomed feature. The song also lyrically deals with the existential drain that is early parenthood, since Justin became a father for the first time just before beginning work on this LP, and this life changing experience is mostly what this album examines thematically. More audible treats to come in the following weeks as the album release date gets closer…stay tuned!